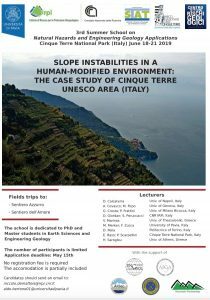 After the positive experience of 2017 in the area of Monte Bianco (Aosta Valley region, Italy), and in 2018 in the Ossola Valley (Piemonte region, Italy), the 2019 third summer school on Natural Hazards and Engineering Geology Applications moves its location in one of the most beautiful areas of Italy: Cinque Terre. The Cinque Terre (located in Liguria region) are one of the most famous UNESCO Italian sites due to their particular landscape that makes this area a site of great scenic and cultural value. The layout and disposition of typical hamlets and the human shaping of the surrounding terrain, overcoming the disadvantages of a steep, uneven terrain, encapsulate the continuous history of human settlement in this region over the past millennium (UNESCO https://whc.unesco.org/en/list/826). The geomorphological setting of Cinque Terre, with steep terraced slopes limited by the sea creates a particular condition for the activation of several slope instabilities in particular during flash floods, which have struck this area very frequently in last decades. From the geological point of view, this area is extremely interesting because its representatives among other the coastal Mediterranean areas where effects of slope processing, climate changes and infrastructures and human modification create a critical connubial. One of the most recent and important flood events occurred in 2011, and was deeply analyzed to define the relationship between the presence of terraces, their level of maintenance, and the activation of shallow landslides. Shallow landslides are not the only slope instabilities that affect this area, as rock falls and rockslides are present and common as well. The critical and interesting aspect of this site is not only the presence of slope instabilities, but also the relationship between these processes and terraces, which are, at the same time, a precious element of the past but could also become a danger now and in the next future. The popularity of the UNESCO site is another important aspect: several trails of Cinque Terre are the most visited of Italy, with thousands of tourists that come to this beautiful environment during Spring and Summer time. A correct administration of this human pressure and an effective management of geo-hydrological risks represents a great challenge and an interesting example for other UNESCO sites. The primary objective of this school is to provide a detailed overview of Cinque Terre and the particular relationship between gravitational processes and a man-modified environment. Starting from a sequence of selected case studies, the school will also make a more detailed analysis of rainfall thresholds, rock slope characterization and stability evaluation. The Summer School is dedicated to PhD and master students in Earth Science and Engineering Geology. Participation and part of the accommodation is free of charges.